Oil pump for automotive are primarily utilized to pump lubricating and cooling oil within the engine of a vehicle. An oil pump is imperative to lubricate the internal components, namely, pistons, camshaft, bearings, and crankshaft, among others. Lack of lubrication leads to friction and wear & tear, which in turn is likely to cease the engine and cause damage to the internal components thereby leading to incur heavy loss. Hence, lubricating oil is circulated at high pressure for better and effective functioning of engine parts. Oil pump for automotive are vary in accordance with the usage of the automobile, such as an off-road vehicle, a normal passenger car, or a heavy commercial vehicle. The fuel efficiency and performance of engine is directly proportional to the proper functioning of the oil pump for automotive. 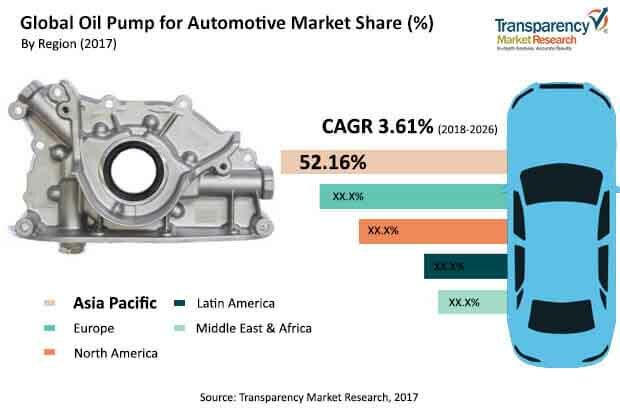 Increased demand for passenger vehicles across the globe is considered to be one of the primary factors propelling the demand for oil pump for automotive market. Rising urbanization in different countries has been attributed toward the increase in overall vehicle miles driven globally, by approximately 2% to 4%, in recent years. This, in turn, has propelled the usage of passenger cars significantly, which is anticipated to propel the demand for oil pump for automotive market in the near future. The automotive industry in Asia witnessed significant growth due to increase per capita income, easy availability of finance, and declining car loan/ bank interest rates. Supported by stable economies and low labour overheads that have entailed in localizing the manufacturing facilities for major OEMs, thereby eliminating large chunks of import duty taxes. Reduced vehicle prices have enhanced the size of total addressable end user market, favouring the mid income group population, which is coupled with better customizable finance options and high disposable income. Oil pump for automotive is used to circulate the lubricant with variable pressures over the complete assembly of automotive engine. As a resultant, the life span of engine components is likely to increase by approximately one to two years. These beneficial properties of the oil pump system can harness better market demand especially for the IC engines, PHEV and HEVs. The global oil pump for automotive market is expected to grow at a CAGR of more than 3.5% during the forecast period, 2018 – 2026. The gear pump segment is estimated to hold the maximum share in 2017. Gear pump is an old tried and proven technology with low manufacturing cost that witnesses significant penetration in the passenger vehicles. Passenger vehicle and commercial vehicle elucidates the vehicle type segmentation. Demand for commercial vehicles is anticipated to rise during the forecast period due to rapid industrialization and expansion of the construction industry in Asia Pacific. Proliferation of process outsourcing and related organizations in Asia Pacific have raised the demand for travel for umpteen employees, which is catered through light commercial vehicles (Vans and Small/Medium Buses), thereby driving the demand for LCVs. Some of the prominent regions taken into analysis for oil pump for automotive market are inclusive North America, Europe, Asia Pacific, Middle East & Africa, and Latin America. The analysis based on the region is done on the basis of the production trend, political reforms, and regulation changes. Asia Pacific and Latin America show tremendous growth in automobile sector over the past few years because of emerging economic conditions, increasing per capita income, easy availability of finance, decreasing interest loan. Key operating players in the oil pump for automotive market are expected to benefit from the formation of strategic alliances with global players in the differential market. The market is burgeoned with some of the key players that have strong global presence and firm establishments which are equally coupled with wide product portfolio. Prominent players in the differential market are Robert Bosch GmbH, Denso Corporation, Aisin Seiki Co. Ltd., Delphi Automotive, Johnson Electric, Magna International, MAHLE GmbH, and Rheinmetall Automotive. For expanding business globally companies are focusing on merger and acquisitions with the regional automotive differential manufacturers. Robert Bosch GmbH is one of the major manufacturers and has expertise in manufacturing of mechanical oil pump. Despite of holding a small share as compared to other major manufacturers Robert Bosch GmbH holds a prominent position in the oil pump for automotive market for vehicles.